Just like the Lumia 950, the Lumia 950 XL comes in a big paper box bundled with an USB Type-C cable and USB Type-C 3.0A charger. Microsoft leaves the headphone choice to the users as there is no headset bundled with the phone itself. The Microsoft Display Dock, required for Windows Continuum to work at full steam, comes as a free gift with the pre-orders in some EU markets, but eventually you'll either have to buy it or use an alternative if one becomes available. Microsoft's Lumia 950 XL spreads at 151.9 x 78.4 x 8.1 mm, which is 7mm taller and 5mm wider than the Lumia 950 due to the bigger screen. It also weighs 15g more, since it has a bigger display, battery and body. Despite our initial objections about the plastic build, there are no two way about it - the Lumia 950 XL seems to have a proper premium build. The perfectly flat front is made of a huge Gorilla Glass 4 piece, which should keep the 5.7" high-res AMOLED screen out of trouble. The battery cover is made of matte polycarbonate and can be popped quite easy. While others are aiming at unibodies made of premium materials such as glass or metal, Microsoft is sticking to the Nokia's roots. This means the Lumia 950 XL can take different rear covers, different batteries and microSD cards. There is even a dual-SIM version - it's like Microsoft followed someone's wish list here. And there is nothing wrong with that. The Lumia 950 XL only issue is its flagship pricing, which don't correspond to the somewhat mundane design. But that's just one way to look it, of course. Others will like the Lumia 950 XL exactly because it sticks to its roots, and instead of being shiny or fancy, it's simple, but stylish. And for a phone born for running Powerpoint presentations or serving as a workstation - it's perhaps the right way to go. 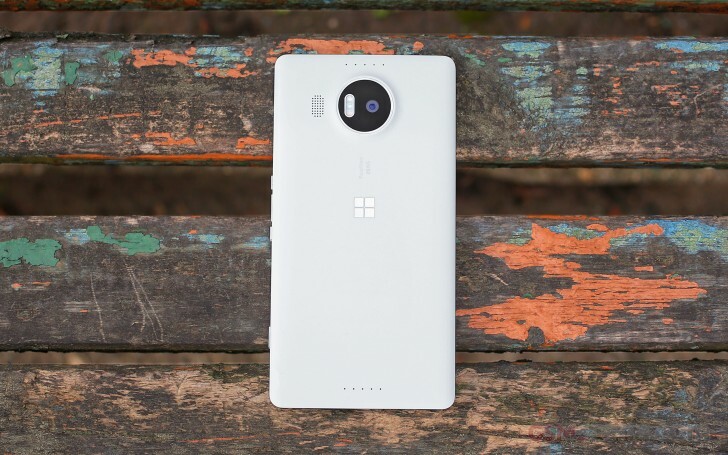 The Lumia 950 XL may be big, but it's not monstrously big. It can easily fit in most pockets because of its slim profile and rather lightweight construction. The build is excellent - the rear cover fits perfectly around the chassis and there are no squeaks or creaks. Handling a phone made of matte plastic is always a pleasure and this choice of materials pretty much guarantees an excellent grip. Operating the Lumia 950 XL with just one hand, or taking pictures, is rather easy and you don't feel the phone will slip any moment now - a rarity these days. The big 5.7" Quad HD AMOLED screen takes all of the attention at the front, but there are quite a few elements deserving attention elsewhere around the body. The earpiece may look lonely at the top at first, but the area above the screen is actually quite busy. Upon a really close inspection, you will also notice 5MP selfie snapper, the iris scanner, the ambient light and the proximity sensors. Up in the top left corner there is a red-light emitter, which helps the iris scanner work in various light conditions. The light is clearly visible but looking at it is not disturbing or unpleasant. But we'll cover how Windows Hello iris authentication works later on in the software part of this review. Finally, two of the four on-board mics are also around the front part of the phone - one below and another one above the screen. There is also another symmetrical pair of mics on the back of the Lumia 950 XL and all four are used for Lumia Rich Audio Recording during video capturing. The main 20MP PureView camera is also on the back. In addition to the bigger sensor, it has been upgraded with ZEISS optics, optical stabilization and triple-LED RGB flash. It is placed on a circular piece of black glass that is making a small hump on the back. The loudspeaker griller is also around. There is nothing on the left, while the right side houses the two-step camera shutter and an odd arrangement of two volume keys flanking the Power/Lock combo. It took us a while to get used to this power button placement, but eventually it turned out reasonably acceptable. The top of the Lumia 950 XL has the audio jack, while the bottom is where the new USB Type-C port is. Popping the battery cover reveals the removable battery, the one or two nano-SIM slots and the microSD bed.